To download the VPM-BL Product Lay-out, please submit the form below and we will e-mail you the link to the file. The VPM-BL is a low-level compact palletizer using sliding plates to accurately position boxes, crates, trays or bins of various sizes (even very small) on a pallet. The VPM-BL is available at a reasonable price providing reliable and efficient palletizing of box-type goods. Boxed goods are positioned and accumulated in the infeed section by a programmable stacking pattern. A slide arm then forms the full layer on a formation plate. The layer is enclosed on four sides by a compression collar ensuring that the layer is accurately positioned on the pallet. Compression collars are used once again after the layer has been formed on the pallet, ensuring an excellent stacking result. 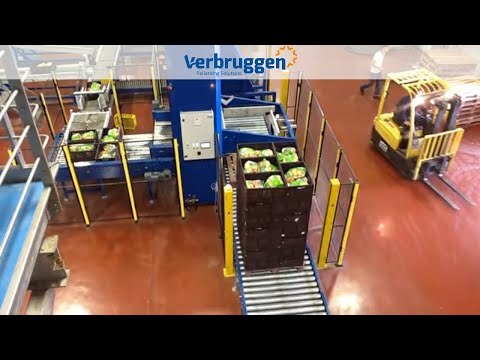 The VPM-BL can easily be upgraded from semi-automatic (where the pallets must be placed on the floor) to fully automatic (equipped with an empty pallet dispenser, sheet dispenser, full pallet conveyors and wrapping machine).